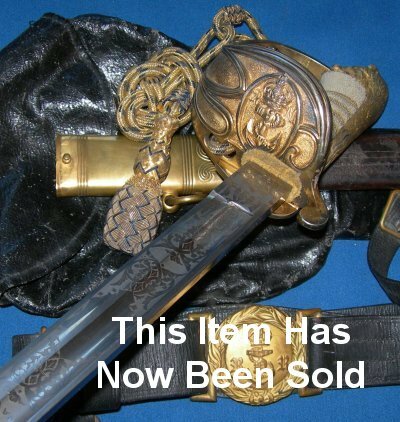 In good condition, a World War One British Royal Naval Reserve officer's sword by Fenton Bros Ltd, Sheffield, Sword Cutlers to the War Office, including original scabbard, knot, belts and all weather bag. This is actually a scarce version of a Royal Navy officer's sword, one for the RNR. With the RNR inscription behind the fouled anchor in the cartouche (hilt) and also the buckle of the belt. The 31 / 3/4 inch blade is in very good condition, with very fine etching, the fouled anchor amid "Royal Navy", plus cypher of the King George 5th, the later aspect being being rare as most RN swords of that era did not bear the monarch's cypher, just the British Royal Coat of Arms. Etched at the ricasso one side "Fenton Bros Ltd, Sheffield, Sword Cutlers to the War Office", the blade is firm in the hilt. The hilt is in very good condition, much gilt remaining, the white fishskin grip and associated twisted grip bindings in very good order, the folding guard section working well, locating onto the pin of the upper locket of the scabbard. The sword knot equally very good. The scabbard in good condition, a little aged and a dent but still good. The belts all very nice. The all weather bag aged (cracked) but still good and a great bonus to the sword. A well above average example. Please quote item reference number G48. Further / large images available upon request.